Dower chest carved date unknown, for Rosemary Payne . Who was Nellie Payne? 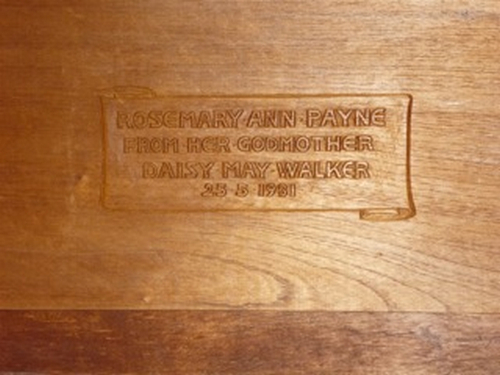 Dower chest for Rosemary Payne. 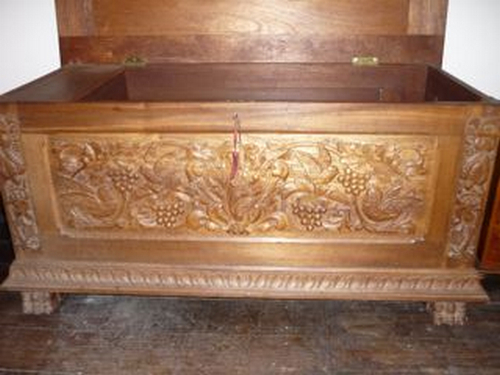 Inside lid of Rosemary Payne dower chest. Rosemary was Geoffrey and Gladys Payne’s youngest child, and therefore Nellie’s youngest grandchild. She was born in 1930 and trained in Adelaide as a kindergarten teacher. Back in Hobart she taught at Lady Gowrie School, Tobruk Preschool and Talire as well as a mobile kindergarten. Her main interest was in teaching children with disabilities. She also loved travelling and playing the piano. Rosemary never married nor had children and she passed away in 2009 aged 73 . 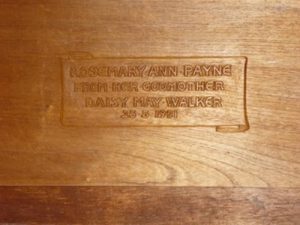 Her dower chest was left to her great nephew, Matthew Payne. Rosemary Payne, an alumna of UTAS, was a dedicated early childhood teacher. As part of her professional and personal commitment she was a long-term, active member of the Tasmanian Branch of Early Childhood Australia (ECA). In this capacity she was a staunch advocate on behalf of young children ensuring their voices were heard by policymakers. Even after retirement from teaching she continued her effective work in local and national affairs of the association. Awarded to a student who has completed three years of the Bachelor of Education (Early Childhood) course and who is determined to be the overall highest achiever based on results in units undertaken in the third year of the course while studying full-time (75% load is regarded as full-time for this purpose.) The prize will only be awarded in a year where, in the view of the awarding committee, in its absolute discretion, a student of sufficient merit is available.